When it comes to clothes, I’m both a creature of habit and an impulse buyer. If I like a product, I’m a fan for life. For example, I’ve only ever bought and worn Levi’s jeans. Never Wrangler. Never Lee. However, there was one disco-era exception. Many years ago, I bought a pair of boots to traipse around town in during the winter, here and whenever I had the opportunity to travel. I don’t remember the brand, but they would last about five, maybe even seven or eight years, and when they wore out, I’d go to the same store to replace them. I must have gone through at least five pairs of the same boots that way. Then one year, when I went to buy a new pair, they were no longer in stock. Anywhere. It turned out they were no longer being manufactured. That became a big hassle because I had to have a pair of boots for the winter. I found a pair online at Zappos that seemed to do the trick. Actually, I found three pairs. I wear orthotics so it’s hard to find a pair that fits just right, which is one reason I stick with what works. One of the three fit and I sent the other two back. Easy enough but still a hassle. That pair lasted until last year. They lasted so long that Zappos no longer had a record of my purchase. So, this fall I had to find another pair of boots. This is where the impulse buyer that I am kicked in. I spied a pair in a store and immediately fell for them in part because of the tiny American flags at the bottom of the tongues. I loved the idea of displaying my patriotism in a subtle, unassuming way. (And it has been subtle; since I’ve had them not one friend or acquaintance has remarked on them.) I also liked the idea of asserting my patriotism in defiance of ideologues who claim that you are only patriotic if you believe in certain policies and agendas. As much as I like wearing the boots, it occurred to me that I think I would have to take the flags off if I ever go overseas. 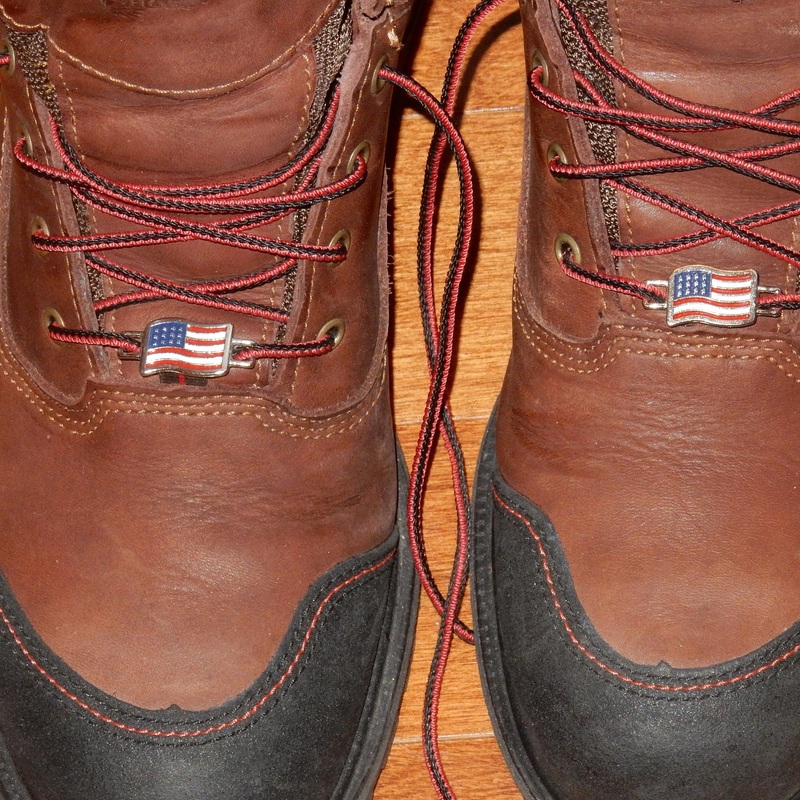 I don’t know if I’m paranoid or savvy, but I can imagine people in countries, countries that are our erstwhile allies, taking exception to the American flags on my boots. America used to be the envy of much of the world. Our American ideals and values were a shining example that other counties and their citizens aspired to. Across the world, America and Americans were beloved or at least respected. I’ll never forget some of the responses that occurred after 9-11. I distinctly remember seeing on television Iranians on holding a candlelight vigil for the victims. Soccer fans in a stadium observed a moment of silence. In Iran! After a quick look online, I found that “mosques in Bangladesh, Yemen, Pakistan, Libya and Sudan trembled with clerics’ condemnation of those ‘cowardly’ and ‘un-Islamic’ attacks. I can’t imagine that happening now or me wearing my boots with the American flag in any of those countries. I don’t think it’s just me. Would you feel safe wearing the American flag in some fashion in foreign countries? In European countries? Even if safe, it’s likely we’d face derision or an earful. Maybe I’m wrong. I hope I’m wrong. But I wouldn’t take the chance. What a pity that is, that American pride can’t be exhibited without fear, or at least hesitation. I’m not pointing fingers at who or what’s to blame for the way America is now viewed by other countries (although I have theories). My hope is that our politicians can enact laws and develop policies so that America is once again a beacon for freedom-loving people around the world. I’d like to walk a mile in my shoes anywhere I want.